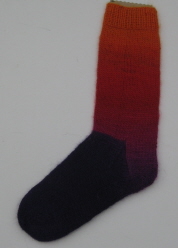 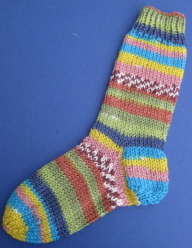 Cuff down sock pattern for baby - these socks make quick and easy gifts and are ideal for using up your leftover sock yarn. 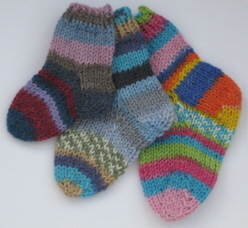 Cuff down sock pattern in three sizes to fit shoe sizes 4 - 12. 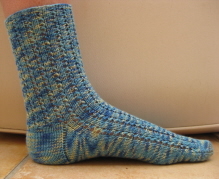 The simple four row pattern looks effective in varriegated yarn. 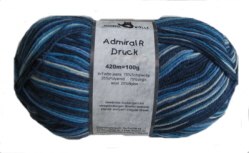 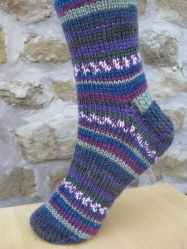 This one is knitted in Wendy Happy 2522 Surf but the pattern is suitable for any four-ply weight sock yarn. 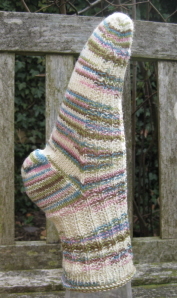 This pattern is for a pair of lacy socks to fit an average female foot. 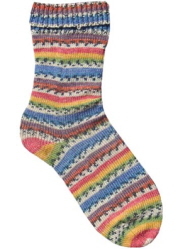 They're perfect for summer evenings when the temperature starts to cool. 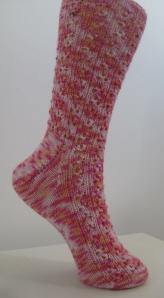 The design on the leg and upper foor is a small cloverleaf lace pattern separated by columns of single purl stitch. 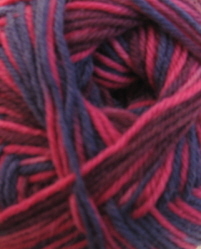 Knitted here in Wendy Happy 2521 Fondant but suitable for any 4ply sock yarn.